Elite Gomoku is an addictive modern version of Noughts and Crosses. The object of the game is to combine five noughts or crosses in a row. But now the game field is unbounded, and there are no more restrictions on the duration of your battles with the computer. 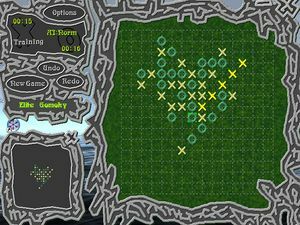 The training mode allows you to use functions such as undo, redo, game hints and warnings. This makes the game a little easier for beginners. If your game field becomes too large, you can use the dockable minimap window for better orientation and faster movement. New skins engine enables you to customize all graphics and animation in the game, change form of main and minimap windows, and also form and position of buttons. You may either choose an interface from the list of provided variants or create your own. If you become tired of playing against the computer, you can use Elite Gomoku to play with your friends on the Internet.